I am so not ready to leave town tomorrow! 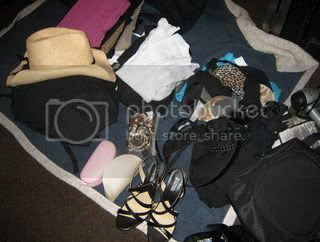 But there is no denying that packing for non-fetishy travel is simpler than packing for kink events. No latex, no thigh-high boots, no trench-coat to cover myself up as I walk through hotel lobbies - it's easy. But I had to do something rather masochistic over the weekend: shop for a bathing suit. Now, I have two bathing suits already, and they're gorgeous, but they're ridiculously expensive little creations, designed for lounging elegantly in the hot tub at a hotel. I would just not feel right about wearing them in and out of the ocean all day, sitting in the sand, and then throwing them over a railing to dry. So I thought: no big deal, I'll just go buy some inexpensive little suit somewhere and let it get trashed. Well. How naive of me. Old Navy and Target yielded nothing that I would be caught dead in. Even Macy's wasn't that great. And I had Jae with me, who kept trying to get me to try on dreadful Hawaiian print stuff, just because she's bratty that way. No. I don't want a boring navy-blue tank suit, but I refuse to wear anything that's all tarted up with faux gold chains and sequins, either. It was like all the suits were either for a) teenage girls who idolize Mariah Carey and Lil Kim, or b) their sensible mini-van driving mothers. I am neither of those things. And I was further handicapped by having resolved not to pay more than twenty-five dollars per piece for this silly thing. It's funny - I like expensive clothes and I will buy them. But sometimes I just get it in my head that I am not going to spend a lot of money on X item, and that's it. I am not going to the damn South of France, you know? I'm not even going to Hawaii. My destination is extremely casual. So it would just be silly to be swanning around in some suit that cost more than the locals make in a day. I'll just have to do some shopping when I arrive. Hopefully a warmer climate will have better choices. Wish me a good flight!